Degnan Design Builders is proud to be a 2011 Madison Area Builders Association Parade of Homes(tm) builder. We are offering Lot 35 in Rivers Turn, Conservancy Place, DeForest. Please view this video to learn more about the site we are offering and contact us if you are interested. But just in case, there’s nothing like a little preparation to be on the safe side. 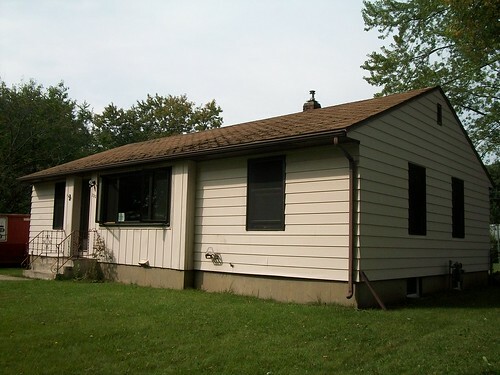 One of Anthony’s current projects is an interesting 1950’s ranch home in Madison, WI. As you drive down the quiet street bordered by mature trees, you realize that over the years the houses here have shed their post war look-alike aura for the more individual identities provided by generations of creative do-it-yourselfers. This home in particular started out modest, but with the prior addition of a room off the back of the kitchen, the footprint offered workable space for the homeowner’s desired improvements and updates. Specifically, he wanted the added room to be comfortable both during the summer and winter, a roof that did not develop ice dams and leak, and a focus on energy savings. Being a Green Built Home builder and remodeler, we at Degnan Design Builders, Inc. are prepared to help all of our homeowners meet these three goals. 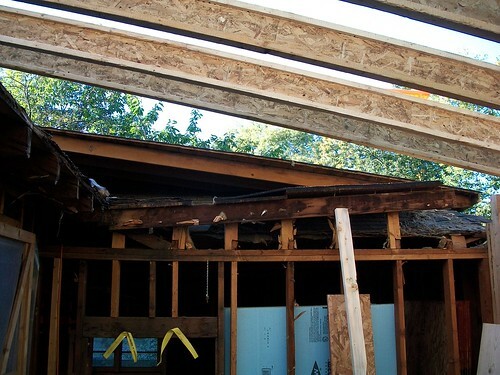 As every experienced remodeler knows, working with an existing structure can offer some unique challenges, and as each new found layer if interest is peeled back, another may appear. In a house of this age, it is not uncommon to find signs of renovations that were poorly executed, and this home is no different: the floor didn’t align, and the roof actually sloped the wrong way. Another roof was built over the top in an effort to correct the problem, but it simply remained non-functioning. Consequently, in an effort to meet our customer’s goals, Anthony and Seth are working tirelessly to make the needed improvements to the existing structure. After removing the old roof layers, Anthony is creating a cathedral ceiling which will give the room interest as well as provide an appropriate pitch for the roof. According to permit records, the roof on this structure is only approximately 5 years old. So, as well as sharing a concern for the triple factors of comfort, functionality and efficiency, this homeowner wanted to know what can make a 5 year old roof wear out as if it has protected a house for decades. Note how the shingles on the front of the house have curled. And, while the homeowner attempted to fix the problem by installing additional insulation in the attic, the new insulation did not extend all the way out over the wall plates at the overhangs of the house. This was the primary source of heat loss in winters past. Simply described, proper insulation (in the Wisconsin winter season) creates a barrier between the heated indoors and the cold weather outside. In reality, however, it does much more than keep the household inhabitants snug and warm. When installed correctly, the insulation also sees to the protection of the house itself: wood, shingles and all. Proper installation takes into account issues such as the type of insulation for the space and how the area is ventilated. But how is it that poor insulation can take years off of a good roof? It begins with our weather. Remember, in the simplest terms insulation keeps the cold out and the heat in. In addition, it also provides a buffer so the cold and heat do not meet anywhere on the house. It is this meeting of extreme temperatures that damages so many roofs, including this one. The damage occurs when snow falls on the roof and stays. If the insulation is inadequate, the rising heat meets the cold and begins to melt the snow. 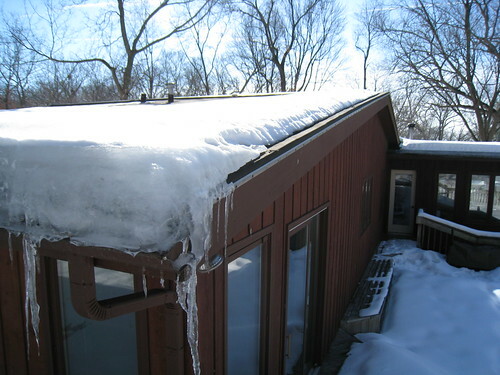 Now, in Wisconsin, in the dead of winter, this melt may only happen for a few hours during the short afternoons followed by a hard freeze at night - especially over the soffits and gutters at the edge of the roof. This freeze thaw cycle can take place daily for much of the winter and is the cause of the huge, dangerous looking, overhanging chunks of ice that we call ice damming. The cycle can go largely unnoticed for most of the winter, but spring eventually comes to Wisconsin, and when the roof begins to reappear, the curled shingles are only the beginning of the problems. 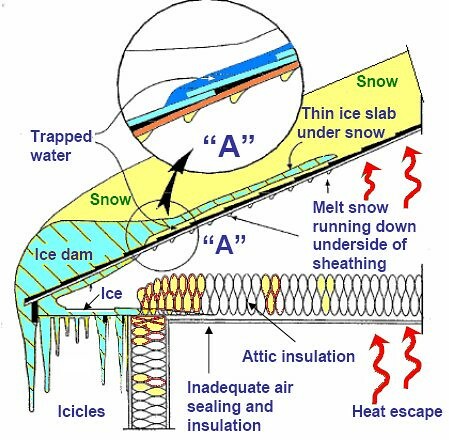 The blockage of ice that forms at (or near) the gutters for most of the winter forces the melting water into the attic. This saturates wood, insulation, and sometimes pushes enough water into the house to penetrate the drywall as well. 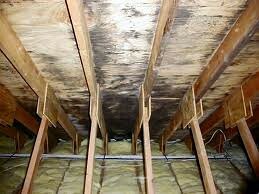 All this moisture leaves tell-tale lines and streaks on ceilings and walls, along with mold in the attic. Luckily, this problem is easily avoidable, and although fixing the damage can be daunting, protecting your home from the potential damage can be rather painlessly arranged. There are many functional options to choose from when considering better insulation, or even replacing a damaged roof. With Anthony’s help, the homeowner of our current job chose a multifaceted approach to make sure that the new roof will stand up to whatever winter brings this year. For his new roofing material, he selected an upgraded, heavier-gauge standing seam metal roof system. In addition, the new roof over the old addition will receive foam insulation and dense-packed cellulose in order to achieve ventilated rafters, air sealing, and maximum energy efficiency. As we replace soffit and fascia around the perimeter of the house, ventilation baffles will be installed along with insulation over the wood top plates of the house (which were the previous heat loss and ice damming culprits). All of these choices were made with energy savings in mind, and because of his focus on efficiency, over the upcoming years our homeowner will not only look forward to lower energy bills, but also a functioning roof that will last, and a room that will be comfortable in every season. Do you have any questions or concerns about your roof? Call or post a message to us and we will do our best to help. You can find us here on our blog, on Facebook, Twitter, and in the office too!